Merchandise and apparel from the hit podcast Mitchum. Mitchum tells tales of bootlegging, moonshine, and running from the cops in the back roads of Georgia in the 60s and 70s. 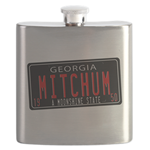 All your Mitchum gear in one place. How else are you going to enjoy the spoils of your labor?